Success With a Picky Eater! Every Wednesday, my friend Dana comes over for dinner with her family. She is a single mom, too, and she is trying to juggle all the running that comes with being the only adult in the household. Her kids are younger–her oldest, J, is one of my 9 year old son’s best friends, and her daughter, E, is 7–so she doesn’t have the advantage of being able to leave kids at home like I do with my 14 year old. So on Wednesday, when her daughter has gymnastics, her son comes here to play with my son while I cook dinner, and we all eat dinner together after gymnastics is over. Her daughter reminds me so much of my daughter in many wonderful ways. She is smart and funny and into fashion and self-confident. Unfortunately, she is also a really picky eater. When I say we all eat dinner together, I really mean that E might eat some plain rice, or she might just watch us eat, or go watch TV. But last night, she tried the black beans and rice I made and declared them to be delicious! She asked me if I could make them again sometime in exactly the same way. I doubt I could do that, because this is something I just throw together, but I thought I had better write down what I did as best as I could remember so that I have a better chance of making it the same way next time. I made a big pot of food, because the boys are starting to eat more and more all the time. I wanted to make sure there was enough leftover for a couple of lunches, too. If you are not feeding boys with hollow legs, you may want to cut this in half, but leftovers freeze well, too. I am estimating the spices, since I don’t usually measure, so I would recommend using a small amount and tasting to adjust. In particular, the thyme is important–I find it really makes the dish, and I like to add a lot. I have a lot of thyme growing in my garden, but if you are using dried thyme, you will want to start with half the amount you would use of the fresh. I also use whatever veggies I have on hand–the bell pepper doesn’t have to be orange, and I often add carrots, or other veggies I want to use before they go bad. Saute the sausage, onion, garlic, bell peppers and tomatilloes in the olive oil until the sausage is cooked through and the veggies are softened. Add the spices, stir to combine, then add the beans, tomatoes with their juice, and the tomato sauce; mix well. Bring to a boil, then turn down to simmer. Taste a small amount and adjust seasonings as necessary. We really like garlic, so I ended up adding a bit of garlic powder here–next time I will add more garlic to start. Then, it is just a matter of simmering while you make the rice, stirring occasionally. I added a bit of black pepper several times, as you don’t get that much for all the grinding, at least not with my old grinder. 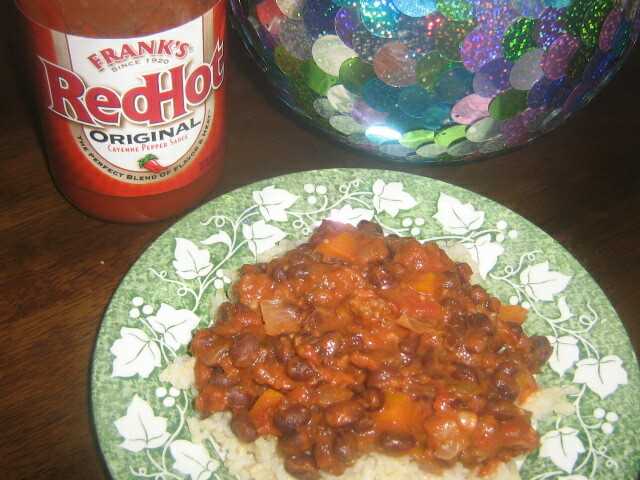 Serve over rice, with a bottle of Frank’s Red Hot for those that like a bit more kick!